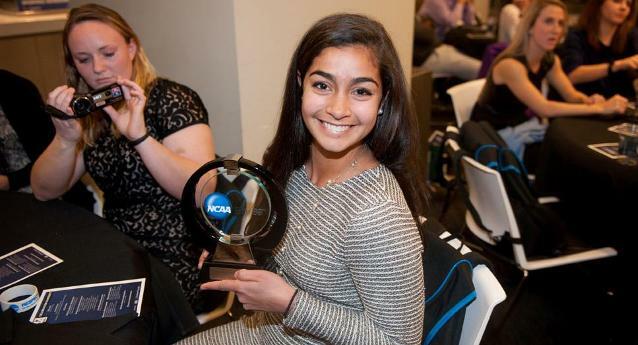 Sophomore Samantha Bagherpour ’17 made University of Lynchburg history by winning the school’s first ELITE 89 award at the NCAA Division III Soccer Championship Banquet on Thursday night in Kansas City, Missouri, where the women’s soccer team is in the Final Four. The ELITE 89, an award founded by the NCAA, recognizes the true essence of the student-athlete by honoring the individual who has reached the pinnacle of competition at the national championship level in his or her sport, while also achieving the highest academic standard among his or her peers. The Elite 89 is presented to the student-athlete with the highest cumulative grade-point average participating at the finals site for each of the NCAA’s 89 championships. The NCAA factors in academic load as well as GPA to decide the recipient. A business administration major with a minor in Spanish, Bagherpour has not only produced in the classroom but has made tremendous strides on the pitch in her sophomore season. The Cary, North Carolina native has four goals and four assists on the year while producing three points in the NCAA tournament thus far. Bagherpour and the rest of the Hornets (25-0-1) will compete against Illinois Wesleyan in the national semifinals Friday at 6 p.m. eastern time.